You just never know where Harry is going to show up next. Check out this screen capture from the 1977 movie Looking for Mr. Goodbar starring Diane Keaton. 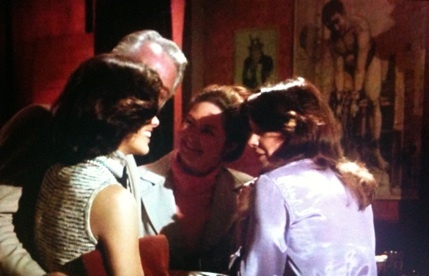 Does that poster back on the wall look familiar? The poster is a well-known Houdini lithograph by J. Zier advertising Houdini’s escape from an Amsterdam jail in 1903. Because the poster used here is in black and white, my guess is it's most-likely a blow-up from the book 100 Years of Magic Posters (1976). 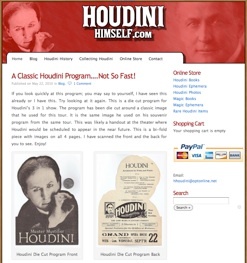 Noted Houdini collector Kevin Connolly has added a blog to his excellent Houdini website: HoudiniHimself.com. Kevin has already blown my mind twice in as many days. Yesterday he revealed the existence of a pink variation of Houdini’s popular pitch book, Life History & Handcuff Secrets of Houdini. Today he’s posted a rare die cut program for Houdini’s full evening show that I never even knew existed (right). Today we have the official press release for the big new traveling exhibition, Houdini: Art and Magic. New York, NY – Harry Houdini (1874-1926), the renowned magician and escape artist, was one of the 20th century’s most famous performers. His gripping theatrical presentations and heart-stopping outdoor spectacles attracted unprecedented crowds, and his talent for self-promotion and provocation captured headlines on both sides of the Atlantic. The Jewish Museum will present the first major art museum exhibition to examine Houdini’s life, legend, and enduring cultural influence from October 29, 2010 through March 27, 2011. Through 163 objects, exhibition visitors will be able to explore the career and legacy of the celebrated entertainer while considering his lasting impact on contemporary art and culture. Included are 26 recent works of art in a variety of media by such artists as Matthew Barney, Jane Hammond, Vik Muniz, and Raymond Pettibon; historic photographs; dramatic Art Nouveau-era posters and broadsides; theater ephemera; and archival and silent films that illuminate Houdini’s role as a world-famous celebrity who commanded a mass audience in the late 19th and early 20th centuries. Magic apparatus – rarely exhibited together – handcuffs, shackles, straitjacket, a milk can and a packing trunk will be showcased in the context of their original presentation. A recreation of the famous Water Torture Cell (much of the original was destroyed in a fire in 1995) will also be on view. Two of Houdini’s private diaries, never before shown in a public exhibition, will be displayed. Visitors will learn about his evolution from a fledging circus performer in the 1890s, to a stage magician at the turn-of-the 20th century, to a daring escape artist in the early 1900s. The exhibition will not reveal the “how-to” secrets of Houdini’s magic performances. Rather, it will describe his audacious innovation in endowing common items with the aura of magic. Following its New York City showing, Houdini: Art and Magic will travel to Skirball Cultural Center, Los Angeles, CA (April 28 – September 4, 2011); Contemporary Jewish Museum, San Francisco, CA (September 26, 2011 – January 15, 2012); and Madison Museum of Contemporary Art, Madison, WI (February 11 – May 13, 2012 ). Contemporary art from the 1970s to the present will be integrated with the historic objects, as the exhibition examines how the magician has served as an inspiration for a significant number of artists. Their works, including video, photographs, drawings, installation, sculpture, paintings, and conceptual works, cite different aspects of the Houdini legend: his straitjacket, handcuff and jail escapes; his metamorphosis and illusionist effects; his magic props and techniques; his physical endurance and masculine prowess; and the fables about his sudden death. 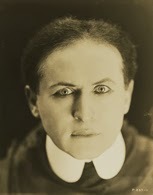 Born Ehrich Weiss in Budapest, Hungary, Houdini was the son of a rabbi who immigrated with his family to Wisconsin in 1878. From the beginning, Ehrich was drawn to illusion, performance, and spectacle. When he was 12, he ran away from home with the intention of joining the circus. Instead, he spent his teenage years doing odd jobs to help support his impoverished family, now living in New York City. Passionate about athletics, he trained as a runner, swimmer, and boxer. These early workouts paved the way for Houdini’s rigorous training routine as a magician and illusionist. Ehrich’s career as a professional magician began after his father’s death in 1892. He changed his name to Harry Houdini as a tribute to the French magician Jean Eugène Robert-Houdin and married Bess Rahner, a Coney Island song and dance performer who became his on-stage partner as well. Over the next decade, Houdini rose to international fame through daring feats that involved seemingly superhuman physical strength and stamina. Throngs of spectators watched as he flailed upside down in a straitjacket or was tossed, handcuffed, into an icy river in a padlocked crate. He freed himself every time to wild ovations. Houdini’s breakout performances had real life significance to the American immigrant population who identified with the act of escape. Houdini’s death, which occurred on Halloween in 1926, has inspired many myths: that he was poisoned; that he died in the Water Torture Cell, and that he faked his death and escaped. It is more likely that he had been suffering from appendicitis and died of peritonitis after suffering a blow to the stomach by a student visiting his backstage dressing room. He is buried in the Machpelah Cemetery in Queens, New York, in a bronze casket fabricated for his buried-alive stunt. A 288-page catalogue will be co-published by The Jewish Museum and Yale University Press. The clothbound book contains 157 color and 45 black and white illustrations, and contributions by Ms. Rapaport, Alan Brinkley, Hasia R. Diner, Mr. de Guzman, and Kenneth Silverman. Essays on Houdini’s life and work are accompanied by interviews with novelist E.L. Doctorow, magician Teller (of Penn and Teller), and contemporary artists including Matthew Barney, Jane Hammond, Deborah Oropallo, Raymond Pettibon and Allen Ruppersberg, documenting Houdini’s evolution and influence from the late 19th century to the present. The catalogue will be available worldwide and at the Museum’s Cooper Shop for $39.95. Houdini: Art and Magic is made possible by major gifts from Kathryn and Alan C. Greenberg and the Blanche and Irving Laurie Foundation, with additional generous support from Rita and Burton Goldberg, the National Endowment for the Arts, the Skirball Fund for American Jewish Life Exhibitions, and other donors. Corporate support is provided by Bloomberg. The exhibition catalogue is funded through the Dorot Foundation publications endowment. Artwork from Bertozzi's Houdini: The Handcuff King on display in L.A.
A sequence of images from Houdini: The Handcuff King by Nick Bertozzi and Jason Lutes are on display as part of the “Monsters and Miracles: A Journey through Jewish Picture Books” show at the Skirball Cultural Center in Los Angeles. The show is up until August 1, 2010 and then travels to the Eric Carle Museum in Western Massachusetts. Released in 2007, Houdini: The Handcuff King recently won the 2010 Garden State Teen Book Award “Nonfiction” section. It can be purchased in hardcover and paperback from Amazon.com . One of Houdini’s most famous illusions was his Vanishing Elephant. Houdini introduced the effect as part of the Cheer Up review at the New York Hippodrome in 1918. He later revived it with a smaller elephant for live appearances at the Time Square Theater to promote his film, The Man From Beyond. But for all its notoriety, precious little is known about exactly how Houdini’s Elephant Vanish looked and worked. While there's an excellent book devoted in part to the effect, Hiding the Elephant by Jim Steinmeyer, there is only one known photo of Houdini with his vanishing elephant (Jennie), taken by the White Studio for publicity purposes. But this photo does not reveal the cabinet, which is key to the effect. But apparently there ARE more photos. Or at least there were. 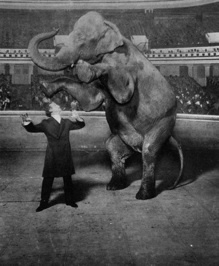 In his own study, Notes on the Vanishing Elephant, Houdini expert Patrick Culliton says six photos of the illusion were published in the New York World in 1918 (he does not provide the exact date). Four years earlier the New York World Sunday Magazine featured the only known photo of Houdini’s Walking Through a Brick Wall illusion, in color no less! Unfortunately, no collector has yet been able to turn up a copy of the World’s Vanishing Elephant issue. In fact, Patrick says this particular issue is the ONLY one missing from the microfilm archives. Is it possible the photos revealed a little too much and Houdini (or Jim Collins) scrubbed the issue from the files? Check out this dramatic illustration of Houdini performing his Vanishing Elephant illusion, published without a source credit on the blog Mostly Forbidden Zone. While the dimensions of the box can’t be correct, there are aspects here that this artist gets right. Showing the cabinet on wheels is one. Also note the circle cut out on the back (this is where the audience would observe the “vanish”). 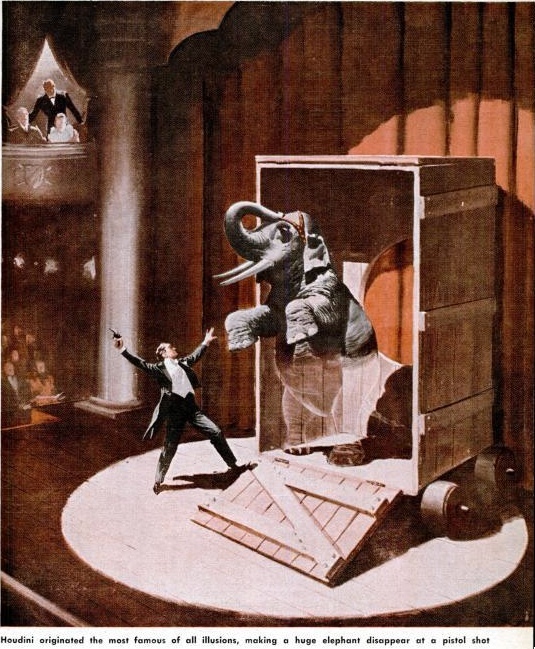 Hard to know if this image is based on the original Hippodrome vanish or the later Time Square Theater version, which used a smaller elephant and cabinet. Nevertheless, this is a nice rendering of one of Houdini’s most famous and still mysterious effects. APPLETON — The ongoing renovation of the Appleton Art Center will uproot the massive metal sculpture that has anchored Houdini Plaza since 1985, reports The Appleton Post-Crescent. 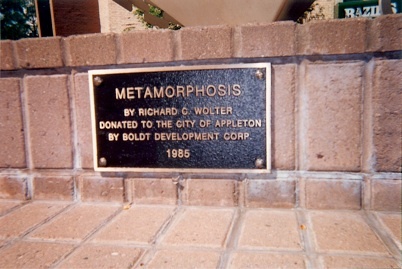 "Metamorphosis," donated to the city by Boldt Development Corp., will be put into storage sometime in the next month for at least a few months as the 1-acre plaza is reworked. "We don't know specifically when it is going to be moved, but we would like to have it removed by the time the downtown farm market begins in the middle of June," Parks and Recreation Director Bill Lecker said. "Metamorphosis" sits atop a red-brick platform that resembles a stage. The abstract metal box is balanced on the point of one of its corners and draped with a padlocked chain. 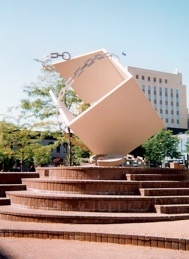 The Richard C. Wolter sculpture, a tribute to illusionist Harry Houdini's famous trick in which he escaped from a chain-bound trunk, stands more than 14 feet tall and weighs about 4.5 tons. The plaza marks where Houdini's childhood home once stood. Lecker said the Parks and Recreation Department is working with Appleton Downtown Inc., a downtown advocacy group that sponsors the farmers market and other events in Houdini Plaza, to discuss a new location for the sculpture. Plans to move the sculpture began with the announcement that the front entrance of the adjacent Appleton Art Center would be moved from the 100 block of W. College Avenue to the west side of the art center that faces Houdini Plaza, Lecker said. The new entrance, built on land donated to the art center by The Boldt Co., extends 30 feet into the plaza, and encroaches on space that used to be set aside for the farmers market and other outdoor events. "We thought there may be a need to offset the loss in property to the art center," Lecker said. Although the sculpture's future site remains unknown, Lecker said the original renovation plans for Houdini Plaza, drawn up before the art center project was planned, called for the sculpture to remain in the park. "Right now, we are looking for the best way to move it," Lecker said. Today I spotted an eBay auction for what is described as a “brand new” copy of the HOUDINI Graphic Biography released by Saddelback Education Publishers in 2008. However, the auction photo shows cover art with a title treatment very different from the ’08 edition. The eBay seller is in Australia so it’s unclear whether this is a region specific design or if this is a new printing from Saddelback also available in the U.S. Guess a little bookstore investigation is in order. 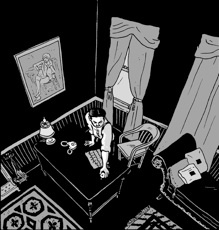 Saddleback’s HOUDINI Graphic Biography is a reprint of a “pocket biography” first released by Academic Industries in 1984.